On March 31, 1914, 24-year-old Frances Fergus, a native of Salt Lake City, died at Chicago's German Evangelical Deaconess Hospital from peritonitis caused by an abortion. Dr. James R. Struble was implicated but released after the coroner's jury inquest. Two years later Struble was implicated in the abortion death of Augusta Bloom. On March 31, 1926, 24-year-old homemaker Louise Maday died at Chicago's West End Hospital from complications of an abortion performed at an earlier date. Midwife Amelia Becker was held by the coroner on April 27. On March 28, 1942, 19-year-old Cleo Moore died at New Rochelle Hospital in New York from peritonitis from an illegal abortion. On March 27, 1929,34-year-old Clara Duvall died at Pittsburgh's Mercy Hospital. Abortion-rights organizations assert that though the death certificate listed Clara's cause of death as pneumonia, she actually died from a self-induced knitting-needle abortion which Clara told her 10-year-old daughter about from her deathbed. I've been unable to verify that there is any evidence that Clara died from any sort of abortion. Operation Rescue has obtained a 911 tape and transcript from Friday, March 21. Staff at Cleveland's Preterm abortion facility called an ambulance for a 22-year-old patient who had stopped breathing and was being resuscitated. Video of the woman being loaded into the ambulance does not seem to show any CPR being performed. 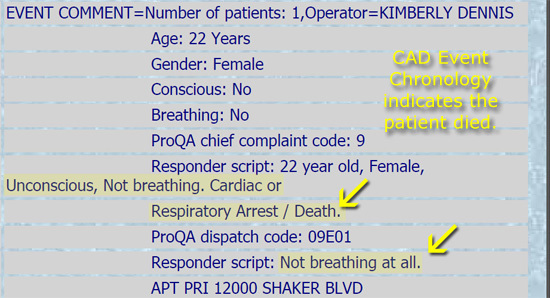 It is possible that the caller confused "bagging" the patient (assisting with breathing" with CPR (trying to restore a heartbeat), and that this is just a case of respiratory arrest being addressed. Since three staff followed -- believed to be a nurse, a doctor, and the office manager -- this seems to indicate attempts to retain control of a living patient. The office manager alone would suffice to do damage control for a dead patient. I'm praying that this young woman is still alive and will recover. In the late winter and early spring of 1848, 20-year-old Ann Gallager of Boston tried a variety of home abortion attempts, in spite of the attempts of a friend and two doctors, including Dr. John Stevens, to dissuade her. Eventually she took ill with a severe fever. Prior to her death on March 25, Ann gave a sworn statement blaming the fatal abortion on Stevens. On March 25 of 1889, in spite of the best efforts of three physicians, Delia Mae Bell of Birmingham, Alabama, died after a sudden, violent illness, eventually traced to an abortifacient purchased from a saloon keeper. Homemaker Celia M. Schultz, age 29, died in a Chicago home from septicemia caused by an abortion on March 25, 1910. A woman named Mary Rommell was indicted for felony murder by a grand jury. The source document does not indicate her profession, or that the case ever went to trial. Mary Colbert, age 21, died on March 25, 1933 from the effects of an abortion her boyfriend, Edward Dettman, had arranged at her behest with Chicago abortionist Dr. Emil Gleitsman.earlier in the month. Jolene Griffith died on March 25, 1962 of a lingering infection caused by an abortion prochoice hero Dr. W.J. Bryan Henrie, an osteopath, performed at his clinic in Grove, Oklahoma on March 3. According to her survivors, Griffith had abandoned her and provided no care to treat the infection. Henire was convicted, and served 25 months of a 4-year sentence. Upon his release, he went right back to doing abortions. On March 25, 2000, 22-year-old Maria Rodriguez went to Steve Lichtenberg at the Family Planning Associates Medical Group's Albany Medical Surgical Center for a late second trimester abortion. At around 9:00 a.m., Maria was showing signs of going into hemorrhagic shock. Rather than transfer to a hospital where there were adequate facilities to determine and treat the cause of the bleeding, Lichtenberg kept Maria at the clinic, where he made various attempts to deal with it himself for an hour and a half. Finally Maria was transported to a hospital, where doctors were unable to save her life. At a National Abortion Federation Risk Management Seminar in the 1990s, Michael Burnhill of the Alan Guttmacher Institute scolded Lichtenberg for "playing Russian roulette" with patients' lives by performing risky abortions in an outpatient setting and treating serious complications on site in his procedure room rather than transporting them to a hospital. Evidently Lichtenberg chose not to listen to Burnhill's warning. 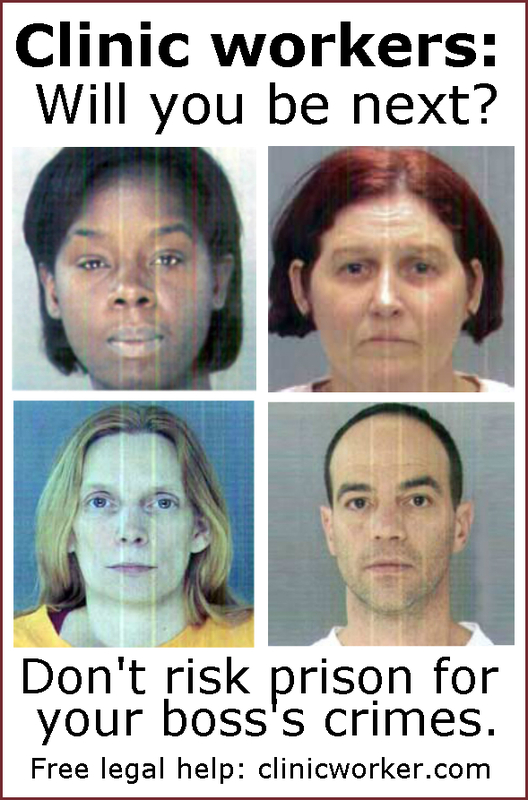 Other women to die from abortions at FPA facilities include:Denise Holmes, Patricia Chacon, Mary Pena, Josefina Garcia, Lanice Dorsey, Joyce Ortenzio, Tami Suematsu, Deanna Bell, Susan Levy, Christina Mora, Ta Tanisha Wesson, Nakia Jorden, Maria Leho, Kimberly Neil, and Chanelle Bryant. 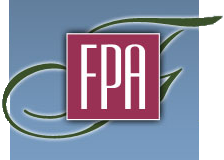 FPA is a flagship member of the National Abortion Federation. On March 24, 1870, Catherine Shields died in Jersey City from an abortion perpetrated by Dr. Charles Cobel. "The infamous doctor was arrested, as was also one Patrick Watson, charged with having outraged the person of the unfortunate girl. Cobel was held responsible for the 1856 death of Catharine DeBreuxal, the 1858 death of. Amelia Weber, the 1865 death of Emma Wolfer, and the 1875 death of Antoinette Fennor. On March 24, 1905, 28-year-old Ida Alice Bloom, a Swedish immigrant working as a domestic servant, died suddenly in Chicago from septic peritonitis caused by an apparent criminal abortion perpetrated on or about March 15. Dr. Julius N. Goltz as arrested as a principal, and James McDonald as an accessory. Both men were held without bail by a coroner's jury. On March 24, 1915, 31-year-old Frances Kulczyk died at her Chicago home from an abortion performed by an unknown perpetrator. On March 21, 1947, Ilene Lorraine Eagen, age 24, was brought to Mankato, Minnesota, to the dental office of W. A. Groebner for an abortion. Court records indicate that Ilene was pressured into the abortion by her paramour, Raymond Older, who refused to marry her and threatened her with bodily harm if she refused an abortion. After the abortion, Ilene became violently ill and lost consciousness. Groebner and Older failed to seek or provide properly care for the sick woman. Instead, Older took Ilene to his service station in Granada, Minnesota and kept her there through the remainder of the night, into the morning of March 22. Older allowed Ilene to languish without medical care. She died March 24, leaving a seven-year-old daughter motherless. Older tried to escape civil liability on the grounds that despite his refusal to marry her, and the threats, Ilene had consented to the abortion and that therefore she was responsible for her own sickness and subsequent death. Life Dynamics lists 24-year-old Lynn McNair on their "Blackmun Wall" of women killed by legal abortions. LDI notes that Lynn was 23 weeks pregnant when she was injected with saline by Dr. Edward Rubin at Jewish Memorial Hospital. The first injection of saline failed to kill the fetus, so Lynn was given a second injection. After this second dose, Lynn went into contractions and slipped into a coma. She died March 23, 1979 of a pulmonary embolism of amniotic fluid, leaving two children motherless. On March 21, 1911, 33-year-old homemaker Katherine "Kate" Kammer died of septic peritonitis at German Hospital in Chicago from an abortion perpetrated by a "midwife" around 5 days earlier. For reasons not given in the source document, there was never any prosecution for Kate's death. On March 21, 1916, 30-year-old Mrs. Anna Krauz died at her home on Union Avenue in Chicago from infection caused by a perforated uterus. An abortion had been perpetrated by midwife Anna Kidicas, who was held by the Coroner but acquitted on trial. On March 21, 1927, 25-year-old Nancy Dawson, an immigrant from England, died in Chicago from a criminal abortion performed that day. That same day, Dr. J.F. Peck and midwife Christine Sedwig were indicted for felony murder on April 1. 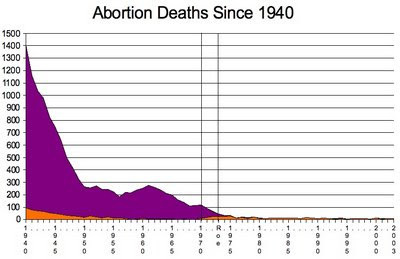 Nancy's abortion was typical of illegal abortions in that it was performed by a physician. 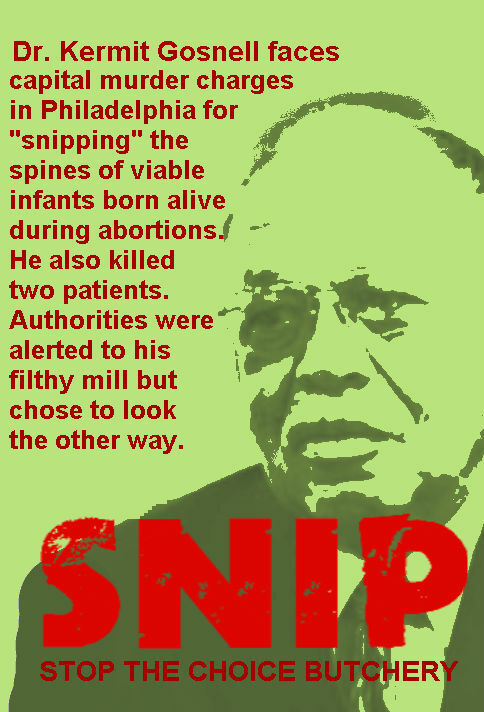 Repost: Where did Gosnell get the idea for "snipping"? It's a year since infamous Philadelphia abortionist Kermit Gosnell (pictured, left) went on trial for murdering live-born infants at his filthy abortion mill. 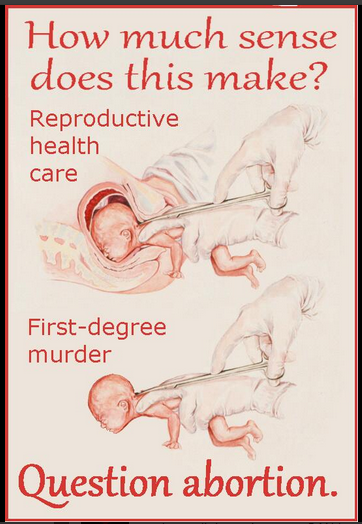 but where did Gosnell get the idea for "snipping" the necks of live-born infants in order to "ensure fetal demise"? Of all the ways to kill a squirming newborn, a scissors to the back of the neck seems a bit arbitrary. It doesn't even seem like the easiest method of "ensuring fetal demise." Even sharp scissors don't just snip through bone the way they snip through paper. I don't think Gosnell simply pulled the idea of "snipping" out of thin air. I'm guessing he got it from somewhere. I'm guessing that he got it from a highly reputable source. I direct your attention, gentle reader, to Martin Haskell's D&X presentation paper to the National Abortion Federation, in which Haskell (pictured, right) teaches this prestigious group of highly reputable providers how to use his new and improved abortion method. This method, like Gosnell's preferred method, involved getting the fetus out entirely in one piece. You might have heard this procedure referred to as "partial birth abortion." "...the surgeon takes a pair of blunt curved Metzenbaum scissors (pictured -- ed.) in the right hand. He carefully advances the tip, curved down, along the spine... until he feels it contact the base of the skull.... the surgeon then forces the scissors into the base of the skull.... Having safely entered the skull, he spreads the scissors to enlarge the opening." 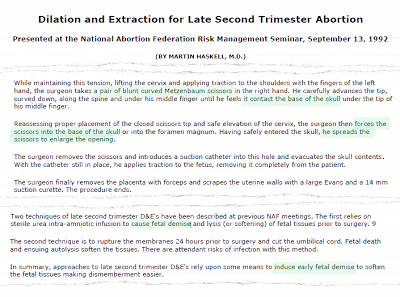 That the baby starts out alive, and that the goal of using the blunt, curved Metzenbaum scissors is to to "ensure fetal demise" is pretty clear when one listens to Haskell's presentation and the discussion afterward. He chuckled that the baby sometimes "helps" -- his word -- by wrapping its little arms and legs around the "surgeon's" hand while the scissors are being positioned. No, the idea of jamming scissors into the back of a living, wriggling baby's neck is not one that is original to the illustrious Dr. Kermit Gosnell. He clearly sat at the feet of the master when he learned how to make sure that the abortion patient doesn't go home with a live baby. 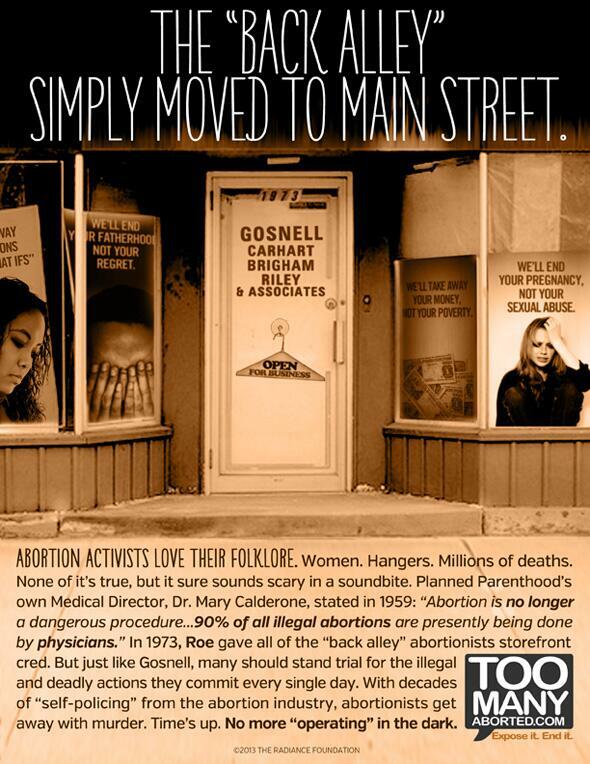 I don't even think that Gosnell came up with the term "ensure fetal demise" on his own. 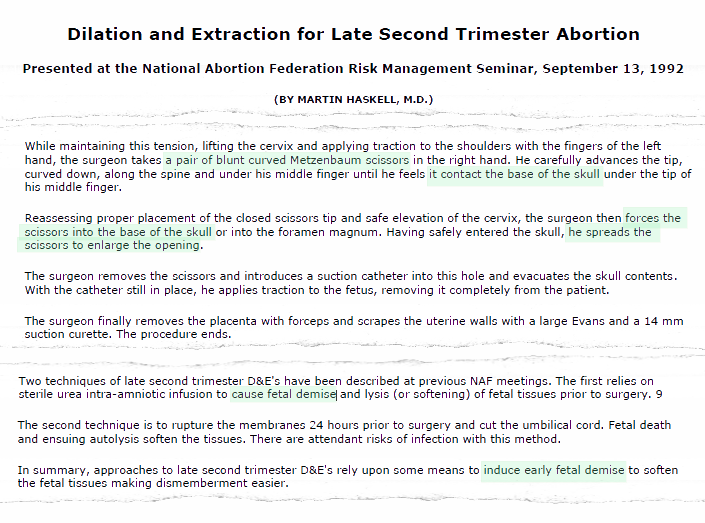 Haskell made reference to two different methods used in late second-trimester abortions to ensure "fetal demise." I would also love to know if Gosnell attended this particular gathering of reputable abortion providers. It was held in September of 1992 in Dallas. A peek into this -- and into entire extent of the National Abortion Federation's role in the Gosnell debacle -- would certainly be a more productive use of Congressional time than taking turns carping about whether or not journalists (who should, after all, be outside Congressional influence) are giving the Gosnell story enough coverage. 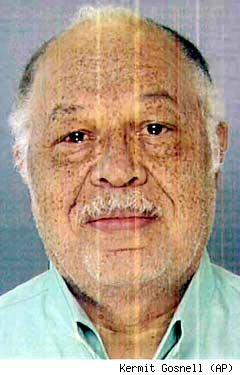 A year ago, Kermit Gosnell, who worked part time at a National Abortion Federation clinic in addition to running his own "house of horrors," went on trial for capital murder for the deaths of live-born babies and of abortion patient Karnamaya Mongar, who was fatally overdosed by his staff. How did this go on so long? In a word: #enablers. 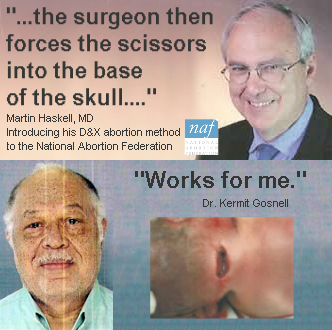 Where did Gosnell get the "snipping" idea? Enabling abortion quackery? I call it the Compton-Carr effect. In early March of 1906, Anna Gosch's boyfriend, Mr. Edwards, went to the town of Kearney, Nebraska and got a hotel room with the intent of perpetrating an abortion. Edwards wouldn't say what happened in the hotel room. He did say that the next day he took her to her home, and using a speculum he tried to insert a catheter into her uterus, which at the time was a method often used by doctors to cause an abortion. Edwards, however, couldn't get the catheter inserted. He said that Anna went upstairs and returned with a catheter with a wire in it, which would stiffen it for insertion. He said that the wire did its job in allowing him to get the catheter inserted. He then bent the wire and threw it away. A physician, Dr. Cameron, was called on Thursday, March 15, to care for Anna. He saw her twice a day until the Monday before her death. During that time he consulted with another physician and concluded that Anna was going to die, which she did at about 6:10 p.m. on Tuesday, March 20, 1906, at 6:10 PM. Edwards was convicted of homicide. Anna's death is similar to the death of "Daisy" Roe, a systems analyst who died in 1990 after allowing her boyfriend to attempt to perform an abortion on her with a piece of aquarium tubing. Mrs. Mary E. Noble, age 38, died at her home in New York's 28th Precinct on March 19, 1867. She had been separated from her husband, Ayers Noble of Tarrytown, for about a year. He testified that the split had been due to her being "too intimate with [George Wait] Carson (the seducer). The coroner's jury concluded that Mary had died from pyemia, "resulting from an abortion produced by the prisoner, Wm. F.J. Thiers, alias Dr. Dubois. They further hold Amelia Armstrong, alias Madame Dubois, as accessory before the fact." Carson was tracked to New Jersey and arrested as well for having arranged the abortion for a $10 down payment and pay another $15 after the abortion. "Dr. Dubois" provided care for Mary as she sickened over the course of about a month prior to her death. On March 19, 1907, Mrs. Bessie F. Simmons, age 30, died at her Chicago home from infection caused by a criminal abortion perpetrated on February 22 at the office of Dr. Charles D. Hughes, who was arrested in the death. Geraldine Easley, age 19, admitted before her death on March 19, 1932, that she had undergone a criminal abortion. Since Dr. James W. Eisiminger and Dr. Richard E. Thacker had been responsible for a string of other criminal abortion deaths in the Oklahoma City area, suspicion in Geraldine's death naturally leaned toward the two known quack abortionists. However, to my knowledge the specific perpetrator in Geraldine's death was not identified. On March 18, 1914, 28-year-old dressmaker Irene Ridgeway died at Garfield Park Hospital in Chicago from an abortion performed by an unknown perpetrator. "Nation's First Birthing Center/Abortion Clinic Opens in Buffalo. This Is Huge." Thus gushes Amanda Marcotte in her blog on Slate.com. You can read her piece for yourself to get her spin on it. Prolifers, myself included, find the idea every bit as revolting as Marcotte finds it refreshing. Either way, though, this "first" is not a first. It's been done before. Raymond Showery ran a bi-named facility, Southside Medical Clinic or Family Hospital of El Paso. It was an inpatient facility where women could go to have their unborn children either delivered alive, aborted, or, a jury found, both. Showery was convicted of the murder of a baby born alive during an abortion. Shower was out on bail appealing the murder conviction when he performed the safe, legal abortion that killed 28-year-old Mickey Apodaca in 1984. Ronald Tauber ran Orlando Birthing Center, a combination abortion/birthing facility, where he performed a fatal abortion on Gloria Small in 1978. There might actually have been others. But the abortion/birthing combo in Buffalo is not breaking new ground. Others have dug that grave before, and buried many a child along with some mothers. So, Buffalo Women's Service / Birthing Center of Buffalo, pride yourselves if you will on being a one stop fetus-disposition center. But you're not the first. And that's some interesting company you've chosen to keep.